Chuck Hall (call sign "Odin") retired as an international airline captain flying Boeing 747’s. Between his professional and private flying endeavors, he has over 30,000 hours of flight time to his credit. His professional career began as a 19-year-old airline pilot flying the North Pacific between Alaska and Japan. During his airline career he rose to Vice President of Operations for a major U.S. airline. Chuck was Chief Pilot on the L1011 program for the Lockheed Aircraft Corporation, during which time he was elected to membership in the Society of Experimental Test Pilots. Chuck graduated first in his class as an Army Aviator and spent his military career flying helicopters. He is a graduate of the University of Alaska. During a span of almost 20 years he participated in the Reno Air Races as an unlimited class race pilot flying various P-51 Mustangs. Chuck won several races and was always a top contender. Today, Chuck is very active in the civilian warbird community and is qualified in most of the former military fighter aircraft in civilian inventory. As a member of the Air Force Heritage Flight Demo Team, he participated regularly in air shows nation-wide with his P-51 Mustang "Six Shooter". Chuck was inducted into the Living Legends of Aviation in January 2009. Jim McGarvie was born and raised in the San Francisco Bay Area. He graduated from San Francisco State College in 1966 as the Vietnam War was heating up, and married Air Group One Adjutant Jan McGarvie. He joined the Navy and went to Aviation Officer Candidate School in Pensacola, FL. After receiving his wings he reported to NAS (now MCAS) Miramar for training in the F-8 Crusader. Following his second Vietnam cruise in F-8s he became an instrument instructor in TA-4s at Miramar before being released from active duty in 1971. He subsequently spent three years flying F-8's and the F-4 Phantom in the reserves. McGarvie flew for Pacific Southwest Airlines and US Airways before opting for early retirement in 2000. He flew his first warbird in 1971—a Ryan PT-22—and in addition to his own Mooney is currently flying Air Group One’s SNJ-5 "Sassy", a P-51 Mustang and an F4U Corsair. 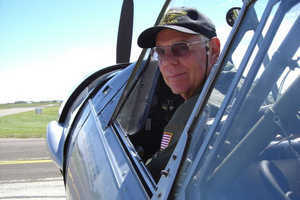 In 2008, Jim qualified as a Navy Legacy Flight pilot. 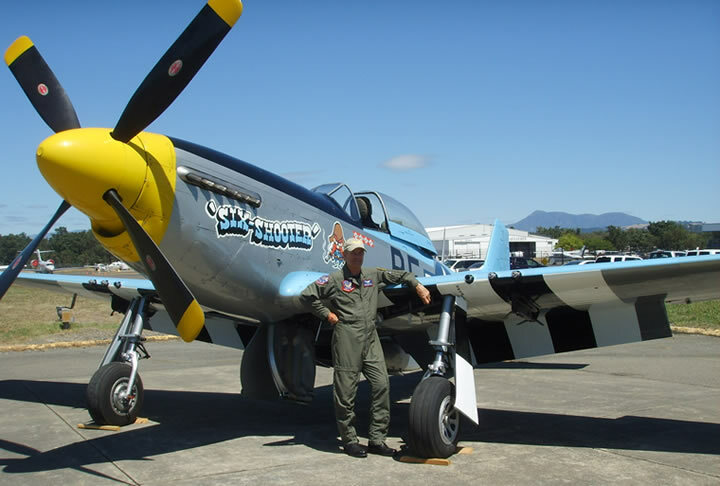 The P-51 Mustang "Six-Shooter" (44-22580), is owned and operated by Chuck Hall. It was rebuilt after World War II by the US military and was sent to the Bolivian Air Force as a counterinsurgency aircraft. 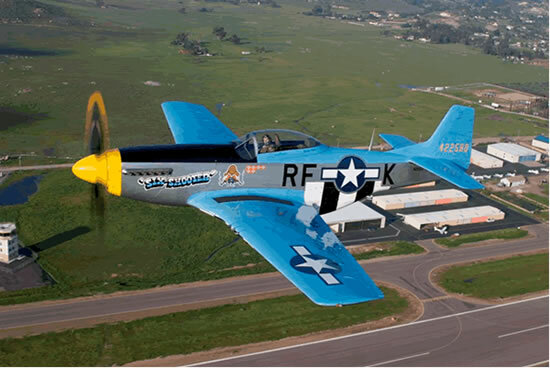 The aircraft was returned to the United States, where Chuck Hall purchased the P-51 in 1995 and was part of the USAF Heritage Flight Team for 10 Years. It continues to be seen in air shows around the country. Air Group One hosts a fundraising event at our hangar on the fourth Saturday of the month followed by a general meeting (open to all). We invite you to join us to share an interest in history, aviation and community outreach endeavors. When you arrive at Chuck Hall Aviation, you will experience the warm and friendly atmosphere that makes Chuck Hall Aviation a place you will want to visit often. Our friendly staff, Paul, Eric, Gary, and Dwight are always there to help with all your aviation needs.